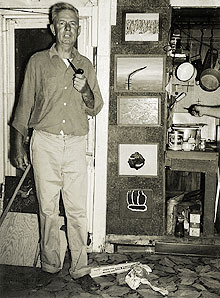 "Bay City Bess: One-Man Exhibits in NY Enhance His Reputation"
en miles of narrow shell road winding through the flat prairie and somber brown salt marshes of Southern Matagoria County link the outside world with Chinquapin Camp and the cabin of Fish Monger-Artist Forrest Bess. If you drive that 10 miles of land from Farm Road 521 to Chinquapin and park your car beside the dilapidated wharf across the channel from Bess' weathered shanty the lanky, gray-haired artist may be around to ferry you across the 75 yards of water that helps isolate his cabin from the surrounding country. And if you're interested in more than buying a pound of shrimp to do a little fishing you may learn something of these canvases in a vocabulary that blends the earthy slang of the oil field roustabout with the highly-specialized terminology of the psychologist. At 46, Bess looks back on a decade as an abstractionist, producing works that have earned him space in a well-known New York gallery for two one-man shows, and numerous exhibitions in Houston and elsewhere. Perhaps no one is more serious than Bess himself about the attention his paintings have received. It is a curiosity more akin to scientific research than to the study of aesthetics, for the big rangy artist is engrossed in the "why" of art. For Bess, art is truth and the artist is the seeker after that truth. "A piece of art should stimulated our inner selves, he says. "If it doesn't, it isn't art." But why do images and colors splashed on a piece of canvas evoke psychic responses? Bess thinks the answer lies within our subconsciousa subconscious filled with latent experiences as old as man that react to the symbolism of the images and colors of the painting. This pondering the nature of the subconscious is deep stuffhardly the thing you would expect a man with the tough, practical mind of an engineer to concern himself with. But Bess is concerned with a recurrent psychic phenomenon which he says has manifested itself since his youth. In the semi-conscious state between waking and deep sleep he sees colored patterns and images of varying design, intensity and hue. Immediately afterward he wakes up. For years he tried to dismiss them as quirks of the senses, though once he actually painted some of them. Bess' childhood was much like that of other boys. Born in Bay City in 1911, he spent his early youth traveling from one boom town to another as his oilman father followed the fast developing Texas oil fields. He attended school in Bay City and in his high school years was a star guard on the football team. After graduation he went two years to Texas A and M College and a year to the University of Texas where he studied architecture. But even then the young artist was seeking something beyond the technical mastery of an art form. He had drawn and painted since he was a small boy, taking his first formal lessons at the age of 15 while the family was living in Corsicana. Bess finally gave up his architectural studies, and went to Mexico where he fell in love with both the land and the people. He made repeated trips between 1934 and 1940, financing his junkets by working as an oil field roughneck. Through a close friendship with a psychiatrist during his army service in World War II Bess received his first inkling of the possible significance of the strange patterns that so often flashed across his mind as he drifted off to sleep. Were these abstractions products of the forces within the subconscious asserting themselves when the conscious mind was no longer able to suppress them, Bess asked? If so what was their meaning? The artist found a possible answer in a Freudian theory that a man may inherit psychological patterns as well as physical characteristics such as his body structure or the color of his hair and eyes. Bess thinks the subconscious mind "files away Kodachromes" of its owner's experiences, translating them into symbols which stand for these experiences. He believes that this has been going on since man's beginning and that somehow these symbols, buried in the subconscious, have been transferred from one generation another. He points out that the conscious mind uses symbolism. The bride traditionally wears white, a symbol of purity, etc. Bess feels that the patterns which he sees and paints are part of a universal symbolism which stands for universal experiences. People who are disturbed by his pictures, he says, apparently find an affinity between the symbols in the paintings and those within their own subconscious. Bess says this explains why people from all walks of life buy his work. "I'm simply a conduit through which these symbols flow," he says. Bess believes that this is the unique contribution the artist can make to his fellow man and for this reason he distrusts subjective art in which the artist strives to put something of himself in his work. For this reason, too, he gave up the Freudian school, which, he says, finds no place in science for art, and turned to the teachings of another giant in the field of psychology, C. G. Jung. Though Bess says he and the famed psychoanalyst have corresponded he denies that he is a Jungian disciple. Nor does he identify himself with modern art. "I suppose I would be classified as a primitive," he says, "but not in the same school with Grandma' Moses."